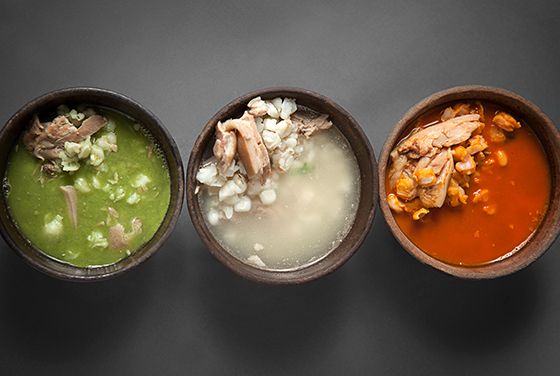 Pozole, one of Mexico's most iconic and beloved dishes, may also be its most controversial. This hearty Mexican stew is popular across Mexico, the United States, and anywhere in the world where Mexicans can be found. A big steaming pot of pozole is a holiday and weekend staple in most Mexican households. Topped with fresh diced onions, cilantro, cabbage, radishes, lime, avocado, and oregano, pozole is kind of like a soup and salad rolled into one. Fittingly, these three main variations reflect the colors of the Mexican flag: red, white and green. Jalisco's pozole rojo is the most well-known, getting its distinctive coloring from chiles like guajillo, ancho or piquin. Pozole verde is made with tomatillos (green tomatoes). This version is typical to the state of Guerrero and is often made with chicken. Other variations include pozole Veracruzano, which is made with seafood, and pozole norteño, called "menudo," which is made with cow stomach. Pozole has had a special place in the Mexican heart since the days of our indigenous ancestors. But there's one major difference between the pozole of our indigenous ancestors and our own: prehispanic pozole was made with human flesh. Yep, you read that right: carne humana. Aztec priests would make human sacrifices to their gods, offering up the heart...and stewing the rest of the body into a ceremonial pozole, which they would then eat in a disturbing version of holy communion. When the Spanish arrived, they outlawed cannibalism, so the Aztecs replaced human meat with pork, which apparently tastes very similar. I may never look at pozole the same way again. It's okay though; pozole's not for looking at - it's for eating.